88 Commercial Real Estate & Properties in Brookvale are listed in 4 categories. We have 46 Industrial Warehouses Lease , 41 OfficesLease , 2 ShowroomsLease and 1 Medical and Consulting PropertiesLease . Quiet Workspace | Enjoyable Working Environment | Reception Services $300pw | 1 Person Workspa..
PROPERTY OVERVIEW $300pw Price incl. Private office suite for holistic health practitioners, counsellors and psychologists in a shared health practice in Brookvale. This is a conscious community of unique practitioners, united in their purpose to offer therapeutic expertise to help clients. You’ll become part of a group of like minded people in a mutually supportive environment to help you grow and flourish. The spacious office suite for rent is filled with natural light and equipped with all the furniture you might need, from solid desks and ergonomic chairs to storage cabinets and bookcases. You will enjoy the services of a reception team and the resources that come with an established practice – marketing, promotion, client bookings and business support from experienced fellow practitioners, as well as use of a small yoga studio/workshop space. This is a rare opportunity to join a highly successful holistic health premises and grow your business in the lovely Northern Beaches. Long term commitment preferred but all enquiries welcome – book a tour to come and take a look! This two storey freestanding building boasts a convenient Brookvale position just minutes from Westfield Warringah. It has great visibility and signage to take advantage of passing trade while it is set back from a tree lined road to maintain a quiet and tranquil atmosphere for clients. There is onsite car parking and free street parking in the area while the mall’s abundant free parking and bus links are also on the doorstep – however your clients get around, they’ll have no problem reaching you here. Located just off Pittwater Road, you will have ease of convenience to Westfield Warringah’s vibrant shopping and dining options, many local cafes and several open green spaces not to mention amazing beaches within a few minutes’ drive. The advertised office space is perfect for a team of 1. If you need more or less space, we have over 30,000 furnished workspaces all over the world suitable for a team of 1 to 200+. Our award winning team offer a free service that will help you find the perfect solution for your needs, so reach out if you need more help. What you get for your weekly rent , 24/7 Access , Access to internal breakout areas , Access to kitchen facilities , Access to secure printer and scanner , Building outgoings included , Commercial grade internet (Free) , Dedicated receptionist to manage your calls and greet your guests , Electricity usage included , Fully equipped boardrooms, meeting rooms and day offices (fees may apply) , Private lockable office Building features , Air conditioning , Boutique low rise buidling , Company Branding at reception , Dedicated men and ladies bathrooms , Modern communal food preparation areas , Open plan layout , Print, scan and copy facilities , Shared office space 400m to Westfield Warringah 50m to Warringah Medical Centre & 150m to the Vale Medical Centre 400m to the B Line and other buses at the Mall 3.2 km to Curl Curl beach 4.8km to Manly Wharf Who is Office Hub? Office Hub is the world\'s No.1 marketplace for office space. We have a huge global selection of coworking spaces, serviced offices and shared office spaces with flexible options to suit teams from 1 200 people. We\'ll take you on a tour of all the workspaces that fit your needs and work on your behalf to get the best price possible. We\'ll help you discover how shared office space can be the most beneficial and budget friendly solution for your business. www.office hub.com Conditions apply – the advertised price includes any incentives offered based on a 12 month agreement and is available to new tenants only. Please note that the rental rate may increase for a shorter rental period. A portion of the square meterage factors in access to shared space. Excellent Amenities | Recognised Building | Fitted And Furnished $711pw | 10 Person Worksp..
PROPERTY OVERVIEW $711pw Price incl. 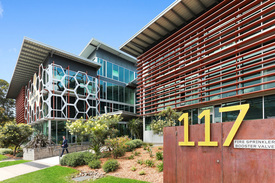 Elegant office space for rent in an award winning Brookvale building by Warringah Mall. This is lifestyle office space at its finest – designer styling, treetop views, a swimming pool, eco friendly credentials and the beautiful Northern Beaches at your fingertips. Available for rent is a large open plan workspace for up to ten people, with the potential to configure a bespoke workspace for your needs. With double height ceilings and windows, these stunning offices, high tech client meeting rooms and breakout areas are designed to inspire creativity and innovation among professional firms. Fabulous opportunity to rent a plug ‘n’ play office space in the Northern Beaches’ most prestigious office complex. Enquire today and we would be happy to discuss your requirements and tailor a solution for you at this premier complex. Lifestyle Working Brookvale is not your typical commercial development! It is the only strata building in Australia to achieve a 5.5 Star Energy and 6 Star Water NABERS rating for its sustainable features; its innovative architectural design aims to reflect the lifestyle of the Northern Beaches, incorporating a heated lap pool and inhouse cafe; its varied indoor/outdoor breakout areas create activity and vitality within the building; the latest technology delivers superfast internet at no extra cost; and ample visitor parking ensures ease of transport for your clients. Freshen up after a cycle or surf with the modern end of trip facilities and wander over to the new food court at Warringah Mall on your lunch. Combining style, convenience and flexibility, this small shared office space in Sydney’s Northern Beaches is on point for every lifestyle. The advertised office space is perfect for a team of 10. If you need more or less space, we have over 30,000 furnished workspaces all over the world suitable for a team of 1 to 200+. Our award winning team offer a free service that will help you find the perfect solution for your needs, so reach out if you need more help. What you get for your weekly rent , 58sqm open plan area fitted with desks and chairs , 24/7 Access , Access to health and wellness room , Access to internal breakout areas , Access to kitchen facilities , Access to secure printer and scanner , Building outgoings included , Electricity usage included , FREE use of the meeting rooms , One simple bill for everything related to your workspace , Regular cleaning , Secure high speed Internet Building features , Air conditioning , Architecturally awarded building , Bicycle storage , Car parking in building (Paid) , Company Branding in Foyer %26 Reception , Dedicated men and ladies bathrooms , Direct access to public transport , End of trip facilities e.g showers, bike racks , Gym and fitness centre close by , Onsite Cafe / Restaurant , Pet friendly office space 50m to Westfield Warringah Mall 900m to bus stop at Warringah Mall 1.6km to Warringah Golf Club 3.8km to Curl Curl Beach 5.4km to Manly Wharf and ferries to Sydney CBD Who is Office Hub? Office Hub is the world\'s No.1 marketplace for office space. We have a huge global selection of coworking spaces, serviced offices and shared office spaces with flexible options to suit teams from 1 200 people. We\'ll take you on a tour of all the workspaces that fit your needs and work on your behalf to get the best price possible. We\'ll help you discover how shared office space can be the most beneficial and budget friendly solution for your business. www.office hub.com Conditions apply – the advertised price includes any incentives offered based on a 12 month agreement and is available to new tenants only. Please note that the rental rate may increase for a shorter rental period. A portion of the square meterage factors in access to shared space. Currently used as a builder’s store there is a large store, modern office and kitchenette with separate WC and shower. Current on this level are a large joinery shop and a small joinery shop. This space would suite a variety of business or could even be used for a man cave. The building has a fully security system. Details • Tenancy area approx. 180 m2 • Gross rent $43,200 plus GST • Undercover loading and unloading. Rob and Leigh welcome your enquiry please call any time. Tasteful ground floor suite in the premier office building on the Northern Beaches is available for lease. The suite is well positioned on the Ground Floor close to the café with a leafy outlook. Details • Gross rent of $33,280 per annum plus GST • Owner pays the outgoigns. • Net lettable area approx. 55.5 sqm • 2 Car Spaces (Tandem). Please contact Rob or Leigh to request more information or to arrange an inspection What makes this complex different? Lifestyle Working is not your typical commercial development. This is the only strata building to have a 5.5 star Energy and 6 star Water NABERS rating certification in Australia. With an innovative design concept it encompasses sustainable principles, the natural environment and the lifestyle of the Northern Beaches. The varied types of occasional and formal meeting points create activity and vitality within the building. The design and layout enhances the amount of natural light and air flow throughout the complex. But it’s not just the design and functionality that makes Lifestyle Working different it is all the extras that come included. There is: • The heated lap pool – have a swim before work or at lunch time or after work. • The high tech meeting rooms fully fitted for presentations – you don’t need to waste space or fitout meeting rooms just choose the one that suits your meeting needs from 4 people to 20 people. 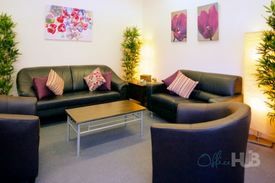 • Common break out areas – you don’t need to go far to find a nice spot to have your lunch or have an informal meeting. If you just want to get out of the office and work outside for a while you will find the space here. • With the latest WIFI technology internet access is available throughout the central common areas of the building at no extra cost. Additionally each tenancy has the internet connected with its own IP address. Located on Old Pittwater Road in Brookvale, the commercial hub of the Northern Beaches, near Westfield Warringah Mall. This Estate is well serviced by public transport and close proximity to a host of business amenities. Refurbished industrial unit in a popular Estate. The circular driveway provides for easy access, loading and parking. Excellent natural light, good clearance and 3 Phase power provide great utility. This unit has an awesome Mezzanine with fully fitted kitchen, built in office fitout and great meeting room. With 8 x data points and 2 air conditioning units, this space is unique. Ideal for a whole array of small to medium size industrial style users, who will benefit from a stylish office/meeting room fitout. Outstanding central Brookvale location – walk to buses, banks, shops and Warringah Mall. The storage units are well positioned on the ground floor with roller shutter door entry & 24/7 security access. Well positioned ground floor storage unit with in built mezzanine providing bonus additional floor space and high clearance. Excellent drive through access from Sydenham road to Orchard Road. "Drive straight to your unit". One of the best in the complex. Additional features include: Flexible 24 hour security access; Light / power available; Easy high clearance vehicular access. Ideal for all types of storage – shopkeepers, tradesman, small business, commuters, archiving, handyman, boats, cars, hobbyists, tinkerers, self storage, etc. This one ticks all the boxes! Popular Estate in the heart of Brookvale, 100 metres to Brookvale business centre and walking distance to all amenities. 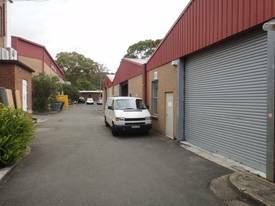 Fully refurbished industrial / production unit with excellent street frontage to busy Orchard Road. Features include: Immaculately presented creative and rustic space with polished concrete floor ideal for the trendy photography, fashion, fitness, studio or storage uses; High clearance and clear span with roller shutter door; Clear panel roofing providing excellent natural light; Halogen lighting; 3 phase power; Internal kitchenette and W/C amenities. One not to be missed. Great thought was given to how the building was designed internally to ensure optimum use of space and light along with additional services, fixtures and fittings of the highest standard whilst at the same time sympathetically restoring and improving the façade. The final result is a state of the art building. Details • Tenancy area approx. 135 – 635 m2 • Superbly fitted out offices and open plan spaces. • Plenty of street parking. • Flexible configuration. • High Speed Fibre Internet available • Onsite generator for back up power Rob and Leigh welcome your enquiry please call any time. Located in popular estate off Old Pittwater Road. Close to Westfield Warringah Mall, Pittwater Road and all amenities. Functional high clearance factory unit attributes include: 3 phase power Roller door access Kitchenette Bathroom facilities The property has good frontage to the estate and will suit most uses. High profile position on western side of Harbord Road, near corner of Winbourne Road, Brookvale. Outstanding ground floor warehouse / office unit within popular two level architecturally designed building. Features include: 3 phase power; Air conditioned office; 6 metre warehouse clearance (approx. ); Carpeted office area; Freshly painted throughout; Ample parking; Central location; Property available with 6 weeks notice. An excellent opportunity to secure a premium property in a central Brookvale location. Prime location on the corner of Cross Street & Green Street, directly opposite Warringah Mall Shopping Centre. Flexible leasing options available with approx. 65 sqm of ground floor office and approx. 163 sqm of first floor office being offered vacant and ready to lease now. PRICING 65 sqm (approx.) Ground Floor Office: $13,000 P.A. Gross + GST 163 sqm (approx.) First Floor Office: $32,600 P.A. Gross + GST 228 sqm (approx.) Ground Floor and First Floor Offices: $45,600 P.A. Gross + GST or Configure your own space and make a reasonable offer and we will negotiate an annual rental amount on your behalf. PROPERTY FEATURES: Direct frontage to Cross Street and fantastic signage opportunities Freshly painted, offering neat and tidy presentation Abundant natural light throughout Individual split system air conditioning in each office Kitchenette Just steps to Westfield Warringah Mall and all it's accompanying amenities Truly a must inspect for those looking for value space in the heart of Brookvale. This is a great opportunity to put your business front and centre on the premier street in Brookvale. The old building has been completely refurbished and extended to create an as new warehouse or workshop and showroom. The property can be leased as one or the upstairs and downstairs can be leased separately. This is your chance to put your business on Winbourne Road. Details • Floor area approx. 1,030 m2 • Upper level Warehouse/industrial retail 400 m2 • Lower Level Workshop/showroom 630 m2 • Amenities on both levels Please contact either Leigh or Rob to arrange an inspection of the site prior to completion. 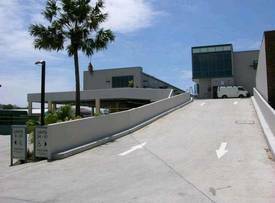 Prestige three level commercial building, plus two levels of security parking. Within close proximity to Westfield Warringah Mall and Brookvale Commercial Centre. This showroom/office suite provides outstanding ground floor exposure to Dale Street, exclusive 31sqm courtyard and on site security parking for up to six vehicles. With a flexible range of options available, the property can be offered in the following format if required: 1) 104sqm + 3 carspaces 2) 133sqm + 3 carspaces 3) 237sqm + 6 carspaces Additional features include: Street fronting office suite Fully air conditioned Impressive existing fit out Wheelchair access Internal Kitchenette Bonus security storage shed On site security parking for six vehicles An outstanding opportunity to secure a modern office suite with exposure and presence in a highly popular complex. Situated in the heart of Brookvale’s commercial precinct within walking distance to Westfield Shopping Centre and all it's ancillary services including public transport, major banks, Australia Post, Retailers, Cafes & Restaurants. Prestige three level commercial building plus two levels of security parking, premium quality finishes and presentation. Additional Features Include: Fully air conditioned Impressive existing fit out Wheelchair access Internal kitchenette On site security parking for three vehicles An outstanding opportunity to secure a modern office suite in a highly popular complex. Lifestyle Working Brookvale is situated on Old Pittwater Road adjoining Westfield Warringah Mall in Brookvale’s thriving commercial precinct, well serviced by public transport, all business amenities and easily accessible by main arterial roads. Excellent existing fit out with modern design and premium finishes featuring large open plan area, board room and separate mezzanine office space. Features include: Excellent natural light; Use of huge private terrace exclusive to only 5 suites in complex; 10 security car spaces + an abundance of visitor parking, Additionally, the complex provides for a number of perks including; Heated lap pool; On site Café & Gym; Separate fully fitted meeting rooms; Break out areas; High speed WIFI internet access available throughout the central common areas of the building at no additional cost. (With each tenancy having its own IP address). Tradewinds is a superbly located premier Industrial Estate central to Brookvale’s thriving trade & Industrial precinct well serviced by all amenities & transport with a massive street profile, hybrid of clean, hi tech warehouse units & on site café. A striking two level trade & business estate, this compact warehouse features electric roller shutter, WC, kitchen facility, 6m internal clearance and three phase power to name a few. Ideal warehouse for passive storage or any clean warehouse use. Situated in the heart of Brookvale’s commercial precinct within walking distance to Westfield Shopping Centre and all it's ancillary services including public transport, major banks, Australia Post, Retailers, Cafes & Restaurants. Prestige three level commercial building plus two levels of security parking, premium quality finishes and presentation. This showroom/office suite provides outstanding ground floor exposure to Dale Street and an exclusive 31 sqm courtyard. Additional Features Include: Street fronting office suite Fully air conditioned Impressive existing fit out Wheelchair access Internal kitchenette Bonus security storage shed On site security parking for three vehicles An outstanding opportunity to secure a modern office suite with exposure and presence in a highly popular complex. Well located on Cross Street just off Old Pittwater Road, central to Westfield Warringah Mall retail complex, all business amenities, public transport, all major arterial roads servicing the area and approximately 16km from Sydney’s CBD. Drive through facility ideal for trade sales. Easy large container access. 4.3m high and 6m wide roller doors. Tailor made for Trade Retail outlet or the suchlike, with a drive through loading facility and side drive exit for easy customer loading and pickup. Current Trade outlet. Also ideal for all new age Industrial users, within such a hot location. Modern professional showrooms a rare find in excellent central location split over two levels with 3 executive offices at one end and the main office comprises 10 partitioned offices and open plan reception area, clear span warehousing with 3 oversized roller shutter doors, 9 11 metre clearance with excellent racking and stacking capabilities, 3 phase power, good natural light and a 10 metre high gantry. Situated in the heart of Brookvale’s commercial precinct within walking distance to Westfield Shopping Centre and all it's ancillary services including public transport, major banks, Australia Post, Retailers, Cafes & Restaurants. Prestige three level commercial building plus two levels of security parking, premium quality finishes and presentation. This showroom/office suite provides outstanding ground floor exposure to Dale Street and an exclusive 31 sqm courtyard. Additional Features Include: Street fronting office suite Fully air conditioned Impressive existing fit out Wheelchair access Internal kitchenette Bonus security storage shed On site security parking for six vehicles An outstanding opportunity to secure a modern office suite with exposure and presence in a highly popular complex. Located in well established estate offering versatile configurations and design on Old Pittwater Road behind Warringah Mall in Brookvale’s thriving commercial precinct serviced by public transport, main arterial roads and all business amenities. Premises provide clear span, 6m clear warehouse, roller door access, functional clear span space, & own amenities.